PROVIDING PROTECTION: The Iowa Seed Corn Cover Crops Initiative began in 2016, with over 175 seed corn growers participating. Cover crop use among Iowa’s seed corn growers has escalated in the past few years. This is largely due to a Water Quality Initiative grant through the Iowa Department of Agriculture and Land Stewardship. The grant provides education and cost-share funds to seed corn growers through the Iowa Seed Corn Cover Crops Initiative. The Iowa Seed Corn Cover Crops Initiative is administered by the Iowa Seed Association and the Agribusiness Association of Iowa, with support from the Iowa Farm Bureau, Iowa Corn Growers Association, the USDA Natural Resources Conservation Service, IDALS and several seed corn production companies. Seed corn acres are highly suitable for cover crops. These fields are more vulnerable after harvest than commercial corn acres for a variety of reasons. Removing the tassels from 80% of a field’s plants during the month of July leaves less stalk and leaf residue at harvest. Add to that, every fifth row of seed corn is mowed down in July after detassling. Also, the way seed corn is picked, which includes husks and cobs, leaves very little crop residue on the soil after harvest. These fields are left with little to protect them from wind and rain erosion, and that’s where cover crops can come into play. Cover crop usage continued to increase in 2017, covering more than 25% of the seed corn production acres in Iowa after harvest (compared to 2% to 3% of Iowa’s total farmed acres having cover crops). Partnerships are a factor in the success of this project. In areas of the state with other watershed projects, higher percentages of seed corn growers use cover crops and other conservation practices, such as no-till and strip-till planting. Seed corn companies including Bayer, Corteva, Mycogen, Gro Alliance, Cornelius Seed, Syngenta, Remington Seeds, AgReliant Genetics and Beck’s Hybrids see the benefits of cover crops and promote this practice with their seed growers. Many of these companies have over 50% cover crop use in their seed corn production fields, compared to 5% to 10% cover crop usage across the state before this program was established. Company promotion has led to a growing interest in cover crops after seed corn production. Even though seed corn production acres in the state were lower this year than in 2016-17, this project has new growers signing up for cover crops. Also, projections show that at least 35% of the seed corn production acres in Iowa will likely have cover crops in 2018. This does not factor in the growers who may be using cover crops without cost-share, or who are receiving cost-share through other sources and are therefore ineligible for cost-share through this program. 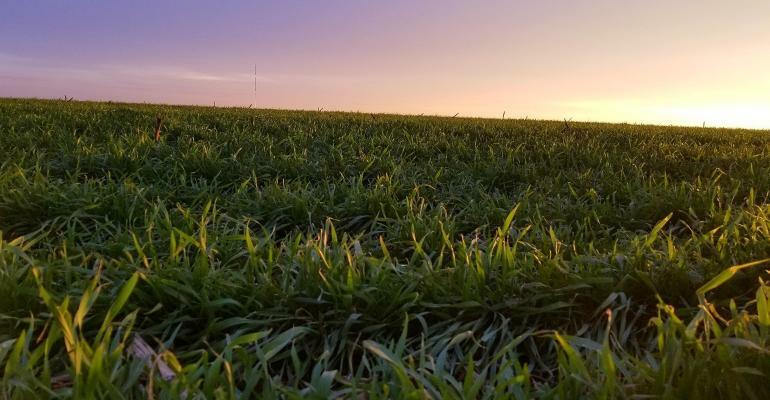 As seed corn growers continue to see the benefits of cover crops to protect the soil over winter, the percentage of those using them will keep growing. For more information, visit sustainableseedcorn.org.